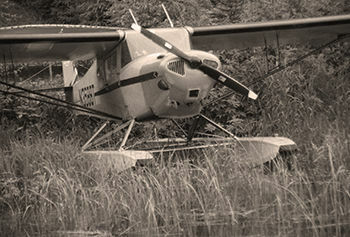 A Piper Cub on floats is a common sight in Alaska. Originally appeared in AOPA Pilot magazine. Seeking adventure, Kay J. Kennedy headed north to Alaska in the 1930s and became enamored by a new character on the literary scene: the bush pilot. She was there firsthand as a journalist to watch this character grow, rising above the nagging summer mosquitoes, off to challenge the glaciers of Denali or the lakes of Kenai. The bush pilots had names like Wien, Reeve, and Sheldon. Over her lifetime Kennedy would accumulate files of information that, when stacked, measured 22 feet high. These were supposed to be the bones of an epic project, the ultimate fat book on Alaska aviation history. But that book would never get written. In this unforgiving landscape, where you are free to shape your own myth, things can become permanently frozen, even dreams. She entered the world as Elizabeth Margaret Kennedy on December 24, 1905, and once commented to writer Jack Allman, "I was born in a mining camp one frosty night before Christmas. Dad always said I was the best nugget he ever got off the claim, but Mother says I spoiled an otherwise perfectly good Christmas." She grew up with the nickname "Toots," later called herself Kay, and added the letter J for the way it sounded. Her father died when she was a baby. Not being close to her mother, the tumbleweed began to roll, living with relatives and a schoolteacher. Kennedy learned early on how to tolerate physical challenges, suffering from tuberculosis and psychosomatic paralysis. She graduated from the University of Wyoming with a degree in geology and began a hardscrabble life. She worked as a teacher in the Badlands of South Dakota and a hunting guide and dude rancher in Wyoming. Kennedy lived alone in a cabin, sat on furniture made from packing crates, and hunted and fished for food. She also wrote a column for the weekly newspaper and developed a reputation for being a "get-the-story kind of reporter who'd go anywhere, try anything," according to Tricia Brown in a 1988 Anchorage Daily News story. By the time she bought a one-way ticket to Alaska in 1936, aviation had been established, more or less. James Martin introduced Fairbanks to the wonder of flight by taking off in a biplane from a stump-strewn clearing in 1913. And in 1924 Noel Wien started Alaska's first scheduled airline between Anchorage and Fairbanks. There were no roads through the late 1920s and the Alcan Highway wouldn't be built until the war years of the 1940s. Pilots like Joe Crosson, Fred Moller, Bob Reeve, and Harold Gillam were primed to break trail, creating an image of the fearless bush pilot. In 1938 there was another bright light on the horizon: Don Sheldon, who, like Kennedy, hailed from Wyoming, and was making his way north. He would go on to become a pioneer who perfected glacier landings on Denali. Early on, Kennedy realized the importance of the dramatic transformation aviation was sparking and began to keep detailed records, separating legend from fact. But life was not easy in Alaska during a time when few unattached women went north. Between stories, she did typing, staked a mining claim during the platinum rush at Goodnews Bay, and took free rides with bush pilots whenever she got the chance. Kennedy spent five months on a riverboat and filed reports based on pilots' and fishermen's accounts of the Japanese invasion of Alaskan fishing waters, although the reports were disputed by fishing officials in Juneau. She quickly became an expert on the territory as it marched toward statehood, building an audience in the Lower 48. "Besides the lack of good landing fields, Alaskan fliers must face foggy coastal weather, lack of communication, incomplete weather reports, few repair shops, short hours of daylight in winter, no beaconed, lighted or even marked air routes, and equipment not designed especially for the rigors of sub-zero flying. Famous for their ingenuity, the pilots rise — literally — to situations." "Alaska, land of fur, fish, gold, and romance, was once remote from the 48 states — but today air transportation has brought it to our doorsteps, if we will but look." "The Alaska Arctic has many faces — windswept tundra; tremendous mountains with nameless peaks; great rivers; midnight sun; tiny tundra flowers; the smile of a wise, old, Eskimo patriarch; the bright eyes of an Eskimo child; the haunt of the polar bear, walrus, reindeer; husky dogs; and the airplane. It is a laboratory for the naturalist and scientist, a treasure hunt for the geologist, and a sanctuary from the noise and bustle of cities." In 1940 Kennedy accompanied Miss Alaska and Miss Nome on a tour to New York City and Washington, D.C. The United States' involvement in World War II prevented her immediate return to her beloved Alaska. She spent the war years reporting for the Great Falls Leader in Montana and The Denver Post. After the war she returned to Alaska, beginning a long association with the Fairbanks Daily News-Miner. In 1966 she took a position as the press and public relations director for Wien Consolidated Airlines in Fairbanks and Anchorage, and a year later published a book, The Wien Brothers Story. Kennedy realized the importance of aerial transportation, which today is the only way Alaska can function with its few highways. "Transportation is the first step toward the development of a region. In the United States, migration to newer country has always followed wars," she wrote. Kennedy was married twice, but never had children, fearing the trappings of motherhood. She once wrote a song/poem called "Saddle Strings" for her first sweetheart, Ed Schriner, but didn't mail it for 50 years. He married somebody else, having grown tired of waiting for the "gypsy-hearted and fiddle-footed" girl, according to writer Marilyn Richardson in a story she wrote for the Fairbanks Daily News-Miner's Heartland magazine. As Kennedy knew full well, bush pilots operated with a sense of urgency in proportion to their short life spans. Some received proper memorials like Sheldon, who now rests in Denali's shadow, buried in a Talkeetna cemetery, adorned with ice axes and propellers. Others never lived long enough to become great, disappearing in the beauty and the madness. Kennedy also operated with a sense of urgency as the pilots began to die off, wanting to grant them immortality. She had been focused on "The Book" upon her retirement in 1970. Her goal was to write a scholarly but readable account of Alaska aviation history, beginning in 1920 and continuing to the present. It was supposed to be factual as well as entertaining, with photos, maps, charts, and statistics. Besides her own notes, she collected information from other published sources and government agencies. She went through three Volkswagens, traveling throughout the United States to interview more than 150 bush pilots, creating an impressive collection of audio interviews. To keep gas in the tank, she sold clothing, rare books, and jewelry; drained her savings; spent two small inheritances; and sold the land she was planning to use for retirement. Total project investment: $50,000. Strained financially, her health problems began to snowball. Kennedy had been dealing with glaucoma for decades and five surgeries left her virtually blind. She also was diagnosed with terminal colon cancer. It was obvious that time was running out, and the right person to help her with the project never came along. Kennedy hired an archivist to work on Saturdays, preparing 60 years' worth of files for donation to the University of Alaska Fairbanks. "I reached the point where I decided to give it up. And it's been my child, my baby. And I didn't think about it for a while, so it wouldn't hurt," she told the Anchorage Daily News. In an interview, Richardson told AOPA Pilot she got to know Kennedy only four months before she died. By then Kennedy had become a highly spiritual person, leaning toward Tibetan Buddhism and belief systems where the person makes the transition, a journey, from this life to the next. She also belonged to the Hemlock Society, a group with a right-to-die agenda for the terminally ill. Kennedy's pain and suffering brought on suicidal tendencies, and thoughts about "taking a walk" in the Chena River, a move that seems slightly paradoxical given the river's history. The Chena has long provided transportation for people who come from around the world to experience healing hot springs. So the journey began. Kennedy planned her death much like she planned her life. She systematically stripped her two-room apartment in Fairbanks of possessions, paid debts, and said goodbye to friends. "My money, eyesight, and life are all going to come out about even. It's time to take my trip without luggage into the sunset," she told Heartland. Richardson remembers her for her sweetness and compassion; she talked about bush pilots up until the final month of her life when her personality began to change. Heavily medicated, she was down to skin and bone. It was probably the only time in her life Kennedy lost interest in news and world affairs. She died naturally in 1993 without needing to take that walk into the river. What remains is Kennedy's collection. It's not the only archive on Alaska aviation, but library archivists say it's the most comprehensive and contains the best photo selection. For her work, she received an honorary doctorate from the university. The records are housed in the school library's Alaska and Polar Regions Department. Patrons are required to wear cotton gloves to protect the delicate files. Going through 47 boxes of materials gives you the impression that Kennedy was a journalist to the grave. She was a meticulous note taker and squirreled away accounting records and grocery lists, things that would only make sense to her. Not big on ego, she was careful to keep herself from becoming part of the story, yet she is there on the sidelines, almost watching over the records. One way or another, those conducting serious research on Alaska aviation find their way to the Kay Kennedy collection. It's as if she'd never given up. Originally appeared in AOPA Pilot magazine. Photo by Nate Ferguson.